A Fasnacht, sometimes spelled Fastnacht or Faschnacht, is a fatty doughnut treat served traditionally on Fastnacht Day, the day before Lent starts. Fasnachts were produced as a way to empty the pantry of lard, sugar, fat and butter, which were forbidden during Lent. Some English-speaking Protestants tend to refer to the day as Shrove Tuesday, and many consume pancakes as an alternative. Basel, Switzerland conducts a fasnacht festival annually. The Pennsylvania Dutch territory surrounding Lancaster, Pennsylvania celebrates the custom as well. Most chain supermarkets in the eastern part of Pennsylvania offer fasnachts, although WalMart offers Pączkiinstead. The pączki is traditionally eaten in Poland on the Thursday prior to Fasnacht Day, although in Polish communities of the US, the celebration is more commonly on Fasnacht Day. Commonly pączki are round, rather than having straight sides, and they are filled with jelly, or sometimes creme filling. In parts of Maryland, the treats are called Kinklings, and is only sold in bakeries on Shrove Tuesday. The German version is made from a yeast dough, deep fried, and coated or dusted in sugar or cinnamon sugar; they may be plain, or filled with fruit jam. Pennsylvania Dutch fasnachts are often made from potato dough, and may be uncoated, or powdered with table sugar or dusted with confectioner’s sugar. The term now is synonymous with the Carnival season in southern Germany, Switzerland, Alsace and Austria. 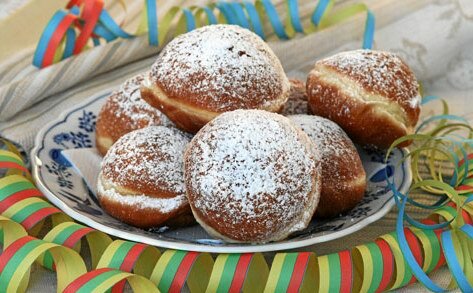 Although usually written “Fastnacht”, there are many local spoken varieties: Fasnacht, Fassenacht, Fasnet etc. Measure 3 1/4 c. flour into a large (3 quart) bowl, and make a “well” in the flour. Just a hole, not all the way down to the bottom of the bowl. Pour some of the warmed milk into the well, about 1/4 c. Don’t sweat being particularly accurate. Add in about 1 Tb. of the sugar and all the yeast. Mix the milk, sugar, yeast and a little bit of the surrounding flour into a batter. Now, let it sit for half an hour. Keep the remaining milk covered and warm; I leave it on an electric burner turned to warm. This is how all German recipes make yeast breads. Make a well in the flour, mix a little liquid, etc. It’s called a Vorteig, a pre-dough. It proofs the yeast (that is, proves the yeast works — very important when you buy yeast from a store that sells mostly Cheetos to college students). Years ago, before modern instant yeasts, this steps was also important to remove the dead yeast cells encapsulating a core of living cells; not strictly necessary in these days of instant yeast, but this is all about tradition. Just before the half hour is up, melt the butter, then combine it with the remaining milk and sugar, the two eggs, beaten, and the salt. Mix this into the proofed yeast, and mix in the remaining flour. If the dough looks wet and gloopy, add up to a quarter cup flour more. However, you want a soft dough that isn’t dry, unless you want fried bread dough rather than doughnuts. Turn the dough out onto a floured work surface and knead just until the dough is smooth, no more than a dozen times. This is not the time for an upper body work out; that’s focaccia. The dough should be soft, sticking just a bit to the heel of your hand. Put it into a bowl (about quart-size), cover and put into a warm room for half an hour. This is a good time to do the dishes. Of course, in my house, any time is good for the dishes, they always seem to be there. After half an hour, the dough with nothave doubled in size. This is OK. Turn the dough out onto a lightly floured work surface and roll out to be about 3/8 to 1/2 inch thick. (When I made these directions, I measured the thickness, but measuring the height and width would have been better.) Using a pizza or pastry cutter (mine’s plastic and says “Guiseppe’s” on it — best pizza in Bucks County), cut the dough into strips about three fingers wide. Cut each strip into rectangles about the size of the palm of your hand, or into squares, or diamonds. Or skip the strips and cut them into circles with a drinking glass, and cut the holes out with a shot glass, like my grandmother did when I complained that doughnuts are round, not square. Cut out all the doughnuts before frying. Right now you can stop and freeze the doughnuts to fry them later. This will almost stop the yeast completely, but won’t kill it. Place doughnuts onto a sheet of wax paper on a plate or baking sheet (plate is easier to transport); doughnuts should not touch each other. When the wax paper is covered, put down another sheet, etc. Cover with a last sheet of wax paper, then tinfoil and freeze. Heat canola or peanut oil to 350 to 375 degrees. An electric frypan would be really good for this. If you are frying without benefit of a self-calibrating appliance (say, frying in your wok), make sure the thermometer is calibrated: boil some water. Does the thermometer read 212 degrees? No? Time for a new one. Drain on paper towels and cool enough to handle. Drop each doughnut into the cinnamon sugar, and coat. Eat immediately or within 24 hours. If you can’t eat them immediately, and will be able to fry them when you can eat them, freeze the dough before frying.